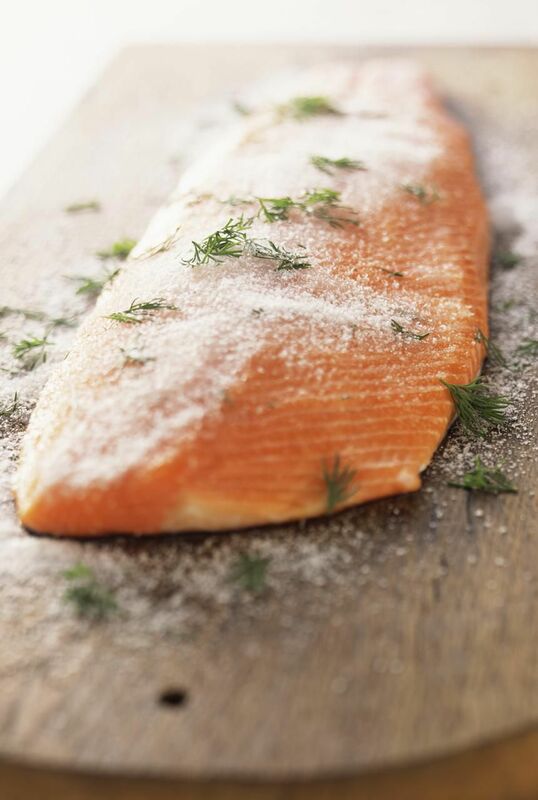 Salmon fillets are cold-cured with salt, sugar, pepper, dill, and liquor to make gravlax. The salmon must be absolutely as fresh as possible. No cooking required. Plan ahead -- this will take about three days. Gravlax is a sophisticated appetizer that is a good choice for a summertime patio party. This recipe is taken from "Fish: The Complete Guide to Buying and Cooking" by Mark Bittman. Fillet the salmon or have the fishmonger fillet it for you; the fish need not be scaled. Sprinkle with the salt, sugar, and pepper, spread the dill over the salmon and splash on your liquor of choice. Sandwich the fillets together, tail to tail, then wrap tightly in plastic wrap. Cover the salmon "sandwich" with another plate and something that weighs about a pound -- an unopened can of coffee or beans, for example. Refrigerate. Open the package every 12 to 24 hours and baste, inside and out, with the accumulated juices. On the second or third day, when the flesh has lost its translucence, slice thinly as you would smoked salmon -- on the bias and without the skin -- and serve with rye bread or pumpernickel and lemon wedges.